Fishing in July is always a fun time to be out on the water here in northern Michigan. Opportunities abound across our northern waters, and anglers can find great success on many of these waters most days. For trout anglers, the magnum hexagenia mayflies are still hatching, and trout anglers know that these big bugs are like candy to trout – really big trout. Early in the morning, or fishing into the night produce the best results for trophy brown trout, but rainbows and brooks will eat these bugs with abandon as well. Later in the month, once the mayflies have stopped hatching, trout anglers may have to switch gears to fish smaller nymphs, but a well- stripped streamer can still draw vicious strikes. closely resemble a mayfly just below the surface. cowbell and spin-n-glo combination is a tough one to beat. action is often hot when using jigs over an ounce. Jonah Jigs have been a staple in my box the past few seasons, as well as large Elk Rapids jigs. Grand Traverse Bays fish very well in July, and there are lots of places to fish on these big bodies of water. Lake trout action is outstanding, with lots of bites from the slot sized fish as well as larger fish over 34 inches, which must be released as per the new DNR regulations this season. Salmon have begun to show, and charter boats have reported a couple of bites per trip, and a few are being brought boat-side. 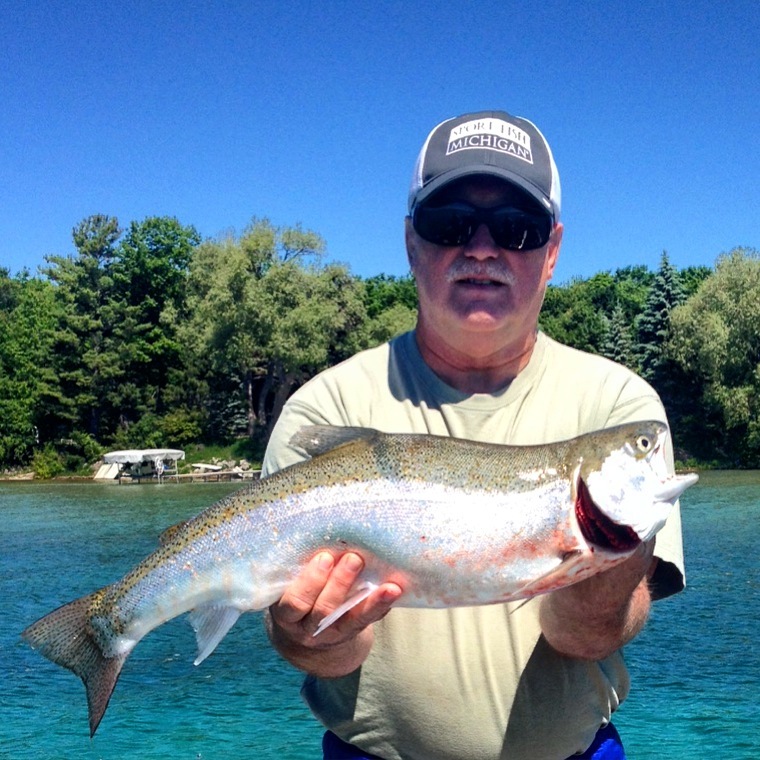 Vertically jigging is another great option in July, and the lake trout have concentrated in deep waters. The deep break south of Marion Island is a community hole, but for good reason as it almost always produces well. 85 to 120 feet are prime places to start for Grand Traverse Bay lake trout. The standard jigging spoons used for Platte Bay work wonders here, too. Grand Traverse Bays are so diverse in their fishery; it’s a treat to be able to fish it almost daily. Walleyes, smallmouth bass, pike, muskies, whitefish, yellow perch, rock bass, lake trout, ciscos, burbot, carp, suckers, steelhead, brown trout and salmon all make these waters home. Some months are better than others for certain species, but July is still a great time to fish for many of them.